Location: 189 Bedford Ave. b/w 6th and 7th St.
Feelings: As we were walking on Bedford, I saw a sign said, "Döner Turkish Food" on a storefront. 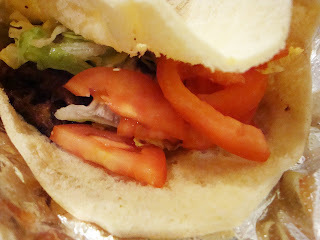 Döner, the European fast food favorite, is something you don't see very often around New York. 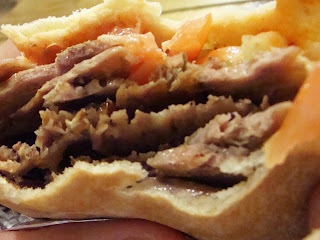 Gyros are more of American favorite..until now! It turns out this particular Döner shop was only open for five hours when we walked through the door. Feeling quite special, I ordered zucchini pancake döner ($4) while RB and JLam ordered the traditional lamb döner ($5). Along with delicious zucchini pancakes, fresh vegetables and sauce were filled in soft flatbread. 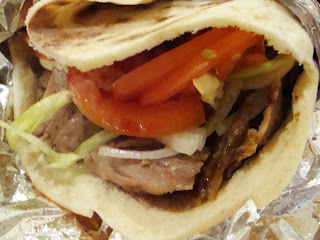 The lamb döner was flavorful and over-packed with meat. All our döners were tasty and filling, and this would be perfect cart food for the lunch crowds as well as late night snacks. RB reluctantly said "It's just like gyro on a pita." But I am a firm believer of döner over gyro. 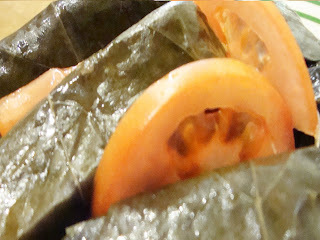 It's easier to eat, and I like that fixings are stuffed inside of flatbread like hummus sandwich. It is hard to walk around with gyro in your hand, but döner is easily portable. It is a perfect addition to Bedford Avenue.